Get your customers ramped up faster with conversational videos. Customer success is the key to long term growth and success. According to the Pareto Principle, or 80/20 rule, 80% of your revenue comes from 20% of your most loyal customers. So how do you make your customers loyal? 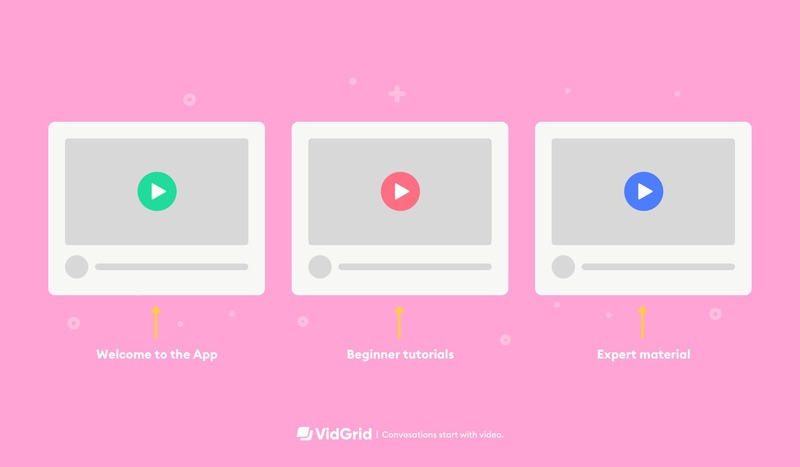 Video onboarding is a strategy to empower customers to use your product better. Through onboarding you can guide your users to achieve their goals with targeted, inside information. Here, you can make how-to videos for important features, and then categorize these videos into relevant folders. A bonus here is that users can subscribe to folders, and be automatically updated each time a new feature video is added to keep up with product examples. With a low touch model such as this, you will want to be sure to ask questions, such as “was this video helpful?” to ensure that you are providing the correct information to your customers. You can also monitor heatmaps of your videos to see where users are dropping off. With a video learning series you can drip training content out over time to ensure that your customer is seeing the right content at the right time, and does not have to wade through an ocean of knowledge. Create a composite of micro demos to show users how to get started. Either create short videos for independent features, or show chapters, so the viewer has autonomy over the learning process. As you onboard customers, video is powerful tool to engage and communicate. You can introduce yourself, share best practices for their use case, and show them how it is done. Introduce yourself to establish a personal connection, and then share your screen to give walk through your product. If you use Fullstory, you may want to record yourself over a session of theirs to give them real time feedback on how they are using your product. If you are repeating a lot of the same content, you may want to merge custom introductions with micro-demos from your video library, to add a touch of personalization to the content. Make sure your customers have a way to get in touch with you at the end of the videos if they have additional questions, whether this is through an open ended question, “What other information would you like to see?,” the ability to record a video back to you to ask for help, or an option to schedule a meeting on your calendar. As you update your product and onboarding changes, re-record over your existing sections, so the links are still valid and your customers always have the most up-to-date information. Add closed captioning and music to your videos to enhance the viewing experience and ensure that even basic screen recordings seem like professional video content.